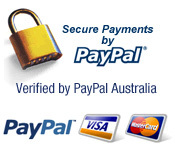 APCR accepts credit card payments via PayPal. You do not need a PayPay account to use this service! To submit your payment, simply enter your sirname and invoice number at the prompt below. You will be taken to the secure PayPal gateway. At the gateway, enter the amount you are paying, and select “Pay by credit card” or use your PayPal account login for more payment options. YOUR SURNAME/BUSINESS NAME AS REFERENCE.